The train pulls into North Richmond Station where we touch-off. As we walk down the ramp to Victoria Street, there is no evidence of the brief showers that passed through just two short hours ago. We turn and walk towards Lennox Street, looking for the All Nations Hotel where we will meet our friends for lunch. 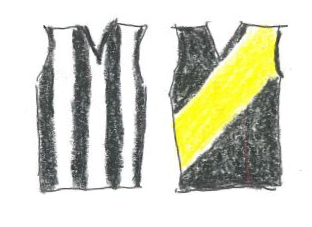 Already, the colours of the mighty Richmond and Collingwood armies are out and about, scarves, baseball caps and 2017 Premiers polo tops are all prominent. The two great working-class tribes of this city are out on the streets, preparing for their big clash. We share a pleasant lunch and a few beers. We are a mixed group, representing both clans so the trash talk abounds. I choose the steak sandwich, which is beautifully cooked and presented. Somehow, me being me, I manage to spill beetroot juice all over my chinos. Damn! First world problems, eh? What are you going to do? At the end of the meal, we jump on their courtesy shuttle bus which makes the short journey to the ground. I make a mental note to myself to do this again, minus the beetroot of course. The Magpie and Tiger Armies congregate excitedly as they press on towards the MCG like two enormous rain clouds, billowy and grey with malice, ready to clash, ready to start the mother of all storms. Electricity crackles through the air, the hairs on the backs of our necks bristle with expectation. How much do we love footy when it is like this? Our teams both play combative football, hard and uncompromising, just the way we have always liked it. Not many teams in the AFL can dominate this town like these two can. Nothing is as colourful, as noisy, as unmanageable as the Richmond faithful in full force…….except, perhaps, the Collingwood faithful when they are in full force. Today, both are here together. Two teams, much-loved and much-hated, two sides of an old coin. The venerable MCG, usually staid and ordered, groans as chaos descends upon it. There’s a masters and apprentices thing happening today. The Tigers, having mastered stingy defence and the application of belligerent and unrelenting pressure, practiced these arcane arts all the way to a Premiership. The Magpies, having watched and learnt all summer, appear ready to take the masters on at this game. This adds an extra layer of spice to an already marketable game. Not unexpectedly, the early forward entrees from both teams are manic and untidy. Mason Cox and Ben Reid make their presence felt up forward, causing major problems for their Richmond opponents with their height and safe hands. They even succeed in getting under Alex Rance’s skin, forcing a dumb fifty meter penalty. Luckily, their kicking for goal is slightly off-centre. The Tigers’ turbocharged pocket dynamo, young Jack Higgins, has a stroke of luck when he takes his first opportunity to kick a goal and an undisciplined act by Collingwood’s Lynden Dunn gifts him another straight away. Richmond is lucky to lead at quarter time. As we enter the middle phases of the game, the pressure from both teams is ridiculous. Mistakes abound, skills and discipline take an almighty hammering. As always happens in times of such adversity, the cream slowly rises to the top. Scott Pendlebury and Trent Cotchin both play wonderful captain’s games, slicing though tight defences like surgeons, finding space where there is none, handling the ball with surety when all others are fumbling. Adam Treloar is prolific and dangerous. Shane “Scissorhands” Edwards is at his creative best. Scoring is difficult. Without this quartet it would be impossible. Collingwood have learnt their lessons well. They take a well-earned four point lead to the half-time break. The arm wrestling resumes after the break, neither team prepared to give ground. As the last break approaches, Josh Caddy strikes two telling blows, giving the Tigers a small but handy lead. The consensus is that Dusty hasn’t done much so far. Is he out of form? Is he injured? Will he lift? The answers to these questions are “no”, “probably” and a resounding “yes.” But we already knew that, didn’t we? On the back of his hard-running and power, the Tiges pile on the goals and quickly take the game away from their plucky opponents. Jack Riewoldt, Dan Butler and Caddy, score at will. Toby Nankervis, Richmond’s whole-hearted ruckman, has battled hard against his in-form counterpart, Collingwood’s Brodie Grundy. Both players have butted heads and attacked each other for three quarters, no beg-pardons asked for or given. When he plonks himself across half back at the start of the last stanza and takes three towering marks, each of which stifles Collingwood’s attempts to wrest momentum from the Tigers, the gig is up. Heads drop and the resistance drains away. The apprentices are not quite ready. The masters have carried the day. Turn up your radio! In many ways the current Tiges are similar in style to the Malthouse Pies circa 2008- 2011; relentless pressure and a smattering of brilliance. Malthouse coached to his team’s strengths/weaknesses; Bucks is starting to realize he needs to do the same. The way Dusty (and the team) are playing at the moment reminds me of a WWE bigshot pretending to be under the pump and then breaking the headlock and flattening their hapless opponent with their “special move”. I was particularly impressed with the Collingwood win because of the job they did on Adelaide recently which in style and in scores was almost identical to the 2017 GF. So they must be OK, hey! BJ, you are right. The Magpies were pretty good last year, they just had a few issues with poor disposal coming out of the backline. They look to have fixed it. They will do well this year. Nice analogy, Stainless. Everybody loves the noble “sport” of wrestling. I currently liken the Tigers to my cat when he catches a mouse. He whacks it a few times then pretends to go to sleep so he can catch it again when the mouse tries to escape.